This article at SCI FI Wire about the new attempt to simplify Dungeons & Dragons to draw back old players got me thinking about the glory days of D & D. About how so much of the charm of the game back in the old days has fallen by the wayside. With this in mind, I decided to reprint one of my Pop Culture columns from 2000, which addressed this very issue. I used to love Pro Wrestling. Now I hate it. Grownups have come and ruined it all. They’ve made it a business worth hundreds of millions of dollars. To speak of wrestling as a business venture in the same breath as “Internet stocks” is blasphemy. That newfangled WCW type crap is all slick and professional-looking flash pots and fireworks, rear projection screens. Who needs it? Watching The Rock wrestle in a big clean convention center is nothing compared to watching George the Animal Steel wrestle in the basement of the downtown Gary, Ind., VFW club. I don’t want shiny, bright lights when I watch wrasslin’; I want dingy 60-watt bulbs and wafting clouds of cigar smoke. When was the last time you saw a good 20 midget free-for-all? I nearly wept when Gorilla Monsoon died last year. And it was tough getting the TV antenna just right, so you could pick up the feeble signals of the low-rent UHF stations that carried wrestling back when it was good and disreputable. Now, a lot of wrestling is produced by Ted Turner’s cable company. Wrestling that you can see without having to jam your rabbit ears against the screen door or wrapping them in tin-foil feels like … cheating. Grownups came, smelled money, and ruined a great American tradition. That’s what grownups do. They take cool things and ruin them, just as surely as they colonize cool neighborhoods and plant Starbuckses and Gapses like kudzu. Grown-ups make it just too freakin’ hard to have fun, anymore. No… that last remark was wrong. They make it too freakin’ easy to have fun. And that’s really, really no fun. I’m musing about the ruination inflicted by grown-ups on our means of good, clean, head-banging diversion because the revised edition of the fantasy role-playing game, Dungeons & Dragons has shipped. For those who don’t know (i.e. those of you with lives), Dungeons & Dragons is sort of like a war game in which each player assumes the role of imaginary character involved in some kind of Lord of the Rings-type adventure. You more media savvy types may have seen it featured on Dexter’s Lab last year. It’s played with outlines and synopses for the adventures, maps, and freaky-looking dice with four to twenty sides (used to determine variables like whether or not your character manages to hit somebody with a weapon). The game has been around since the mid-’70s. I started playing in the late ’70s and stopped soon thereafter. The game stopped being fun. Lousy, stinkin’ grownups…. The fun of Dungeons & Dragons in those primal days -back when we used to beat up kids who wore those preppy IZOD alligator shirts – wasn’t playing the game … it was getting hold of the stuff you needed to play it! You couldn’t buy D&D stuff at every WaldenBooks. 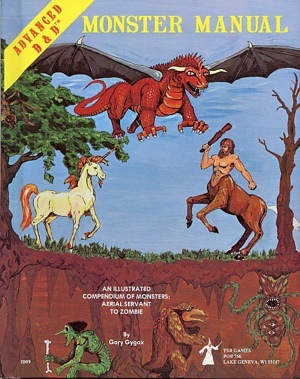 Most of us got hold of Dungeons & Dragons rule books and adventure scenarios (called “modules”) by making third and fourth generation photocopies of whatever we could lay our hands on. This was back before there was a Kinko’s on every corner, too. We usually had to go to the library to photocopy, and there was a ten-page limit per session on most of those machines; we’d spend an entire day copying a Rule Book. There were “publishers” to which you could write for modules – “publishers” that turned out to be a couple of kids in a dorm room in the Midwest somewhere. For a couple of bucks, they’d send you a mimeographed module written in 12-point pica with maps and charts done on the kind of graph paper you used in seventh grade to learn about X and Y axes. 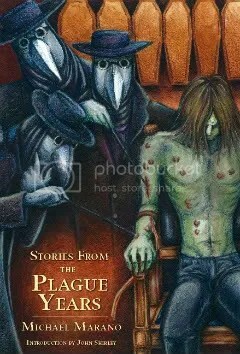 The illustrations? Magic marker. And my God … some friends of mine got hold of modules and revised rules over the nascent Internet (! ), scoring the goods by sneaking into the computer room of the local college and getting the texts one painfully slow line at a time as it was transmitted from one Honeywell mainframe to another. And the dice! Those weird, beautifully shaped dice! You couldn’t just buy them! You had to go to a hobby store – more often than not one on some forsaken road across from an establishment that was on some nights a hot dog stand and on others an unlicensed gun club – and you had to special order those suckers. It was the getting that was the kick. We were on a real-life quest. Not quite Arthurian in scale, but when we were 15 and couldn’t drive, it seemed epic enough. The D&D adventures we played were just complements to the adventures we had getting the materials. You could relate to a quest to throw a cursed ring into a volcano in a land full of orcs if, in order to purchase some funky-looking dice, you had to take two or three buses into a crummy part of town to get to a joke shop you heard about from a cousin’s-best-friend’s-roommate that had a couple of sets stashed under the fake dog poop. But then the grownups came. They smelled money. All of a sudden, everyone was playing D&D. It became a full blown fad. Everything got too easy to get. The rule books were repackaged and shipped by the millions. Feh. I’ve taken a look at the new, revised D&D Player’s Manual. It’s shiny. It’s slick. It’s very professional-looking. It comes with a CD ROM. Across the street from the game shop where I’d found it was a new Starbucks. I thought despondently about Gorilla Monsoon. Maybe I still got some of those old photocopies some place. I should call up my old high-school buddies, see what they still got lying around. That’d be a real quest, now, wouldn’t it?